Daoism: Monotheism, Trinity or Polytheism? – For Christians, To be Born Again in Islam! Daoism: Monotheism, Trinity or Polytheism? Daoism, also known as Taoism is an organized religious tradition that has been evolving in China, Korea and Japan for last two thousand years. It is understood that it has gone though a continuous change and self-invention within different environmental contexts. The Daoism as it existed at its origin has been changing consistently and its followers recognize the mysterious creativity within the very fabric of time and space, and human experience of changes in our bodies and world around us. It is difficult to estimate the total number of followers due to a variety of factors including defining Daoism. Various estimates range from twenty million to over fifty millions. Daoism was formally established in the late Eastern Han Dynasty (25-220). Northern and Southern Dynasties (386-589) saw it become the legitimacy religion like Buddhism in China, because it was supported by some emperors for political reasons. Daoism welcomed its silver age from Tang Dynasty (618-907) to Northern Song Dynasty (960-1127). Many sects were formed during this period. Daoist temples were scattered all over the country and Daoist masters came forth in great number. After Yuan Dynasty (1271-1368), Daoism has divided into two major sects: Quanzhen Sect and Zhengyi Sect. Present day Daoism is not monotheistic and it believes in a variety of deities and spirits which may or may not originate from this world and different Dao groups may glorify different gods. There is some evidence of a concept of “Trinity”; San Qing (Daoist Trinity) refers to three supreme Gods respected by Daoism, including Celestial Worthy of Primordial Beginning, Celestial Worthy of Numinous Treasure and Celestial Worthy of the Tao and its Power. Worship for the Daoist Trinity dates back to the 4th century. The Daoist Trinity lives in a far and mysterious fairyland, and governs countless other Gods while supervising the social life of human beings. Thus, ultimately emphasizing polytheism. It has no resemblance to Christian Trinity, lacking any concepts of original sin, salvation, or redemption. There is no mention of the Father, Son of God or the Holy Spirit. Sociologists claim the man of antiquity first believed in many Gods and then over time came to be believer in one God; polytheism evolved into monotheism. They think the idea of deity must have evolved out of fear of things that were eventually thought to be deities. This argument is questionable: do we worship what we fear? The ancient civilizations including Egyptians, Greek, and Indian were polytheistic, but were they polytheistic from the beginning? Islam, on the other hand, presents an opposite view. According to the Holy Quran, the book of Islam, divinely guided prophets were sent all people teaching them about One God. It was the degeneration of that religion overtime that lead to believe in many Gods; monotheism evolved into polytheism. The Founder of Daoism must have taught of One God. With the passage of time it degenerated into polytheistic ideology. In Daoism, eternal truth is embodied in a being known as Tao whose attributes are spiritual and holy rather than material. Tao can be aptly defined as a personification of eternal virtues. They are precisely the same attributes as ascribed to God in Islam and other Divinely revealed religions. Daoism teaches man to completely submit to Truth (Tao), and to strive to modulate Tao. Tao is the model, and Daoism is the way to gain nearness to this model. It is pertinent to note that Chinese philosophy had its roots in religion, but with the passage of time its religious origin was obscured. Its followers adhered to the philosophy itself but thought it unnecessary to have any direct link with the source which had nourished it in the past. Consequently, the image of God was gradually impersonalized and the followers of Tao ceased to cultivate a personal relationship with Him as a Supreme Conscious Living Being. In short, like Confucianism, Daoism too at its source believed undoubtedly in a living, personal God to be the Eternal Truth. In the original works of Daoism or Confucianism, it was not considered sufficient just to gain an intellectual understanding of Tao, but the entire goal of life was set to mold one’s character and actions according to the concept of Tao. However, in the source material of Daoism, as quoted above, the belief in Tao as an eternal intelligent creator has over the ages been obscured. But the idea of revelation itself is still retained, though only under the guise of inspiration. A conspicuous shift from Divine revelation to inspiration without a Divine origin, marks the trend among the spiritual thinkers of the later ages until no trace of Divinity is left in their writings. Inspiration to them became purely an internal phenomenon, which through deep contemplation and meditation could lead to the fountainhead of truth within oneself. To delve deep into one’s nature can of course lead to the discovery of inner truth, but the Tao experience of inspiration as quoted in the authentic Daoist works is not entirely internal. With them inspiration has its own limitations—it cannot lead to objective truth which lies beyond the reach of the person who undergoes an inspirational experience. 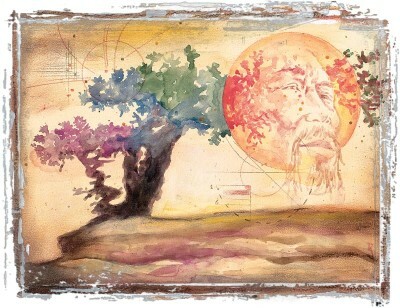 The very foundation of Daoism is based on the great vision of Fu Hsi. The definition of inspiration however extended, can in no way be applied to that vision. When interpreted, it comprises such fountainheads of knowledge as were to give birth to many highly evolved and complex Chinese philosophies and sciences much later in time. This is sufficient to illustrate the case in point. Inspirations cannot give birth to prophecies about unknown future; no way can they lead to such future events as stand witness to the existence of an All-Knowing Supreme God by their realizations. [i] Translation of 2:139 by the author.